Previous studies have indicated that high levels of urinary albumin excretion (UAE) are associated with an increased incidence of cardiovascular morbidity and mortality. 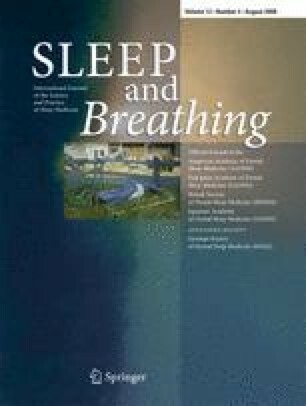 This study examined the association between UAE and obstructive sleep apnea syndrome (OSAS). The study included 35 newly diagnosed OSAS patients and 11 nonapneic controls. Subjects with diabetes mellitus, hypertension, a history of renal failure, cardiac failure, coronary heart disease, collagen tissue disease, high serum creatinine, and urinary infection, and who use angiotensin-converting enzyme inhibitors and were women were excluded from the study. A single void morning urine sample at the baseline examination was used to measure UAE. There were no significant differences in the age, body mass index (BMI), and smoking habits of the OSAS patients and controls. UAE of the OSAS group was significantly higher than that of the control group (23.3 ± 6.1 μg/min vs. 6.5 ± 2.1 μg/min, respectively; P = 0.002). UAE was positively correlated to length of time spent at an oxygen saturation of <90% (r = 0.503, P = 0.002) and BMI (r = 0.361, P = 0.033). Regression analyses (r 2 = 0.504, P < 0.0001) showed that the length of time spent at an oxygen saturation of <90% (P < 0.0001) was risk factor for UAE, independent of age and BMI. Our study supports the notion that low-grade UAE is associated with non-hypertensive/non-diabetic OSAS, independent of age and BMI. Low-grade UAE may be a marker for subclinical vascular damage that predisposes OSAS patients to future cardiovascular disease.